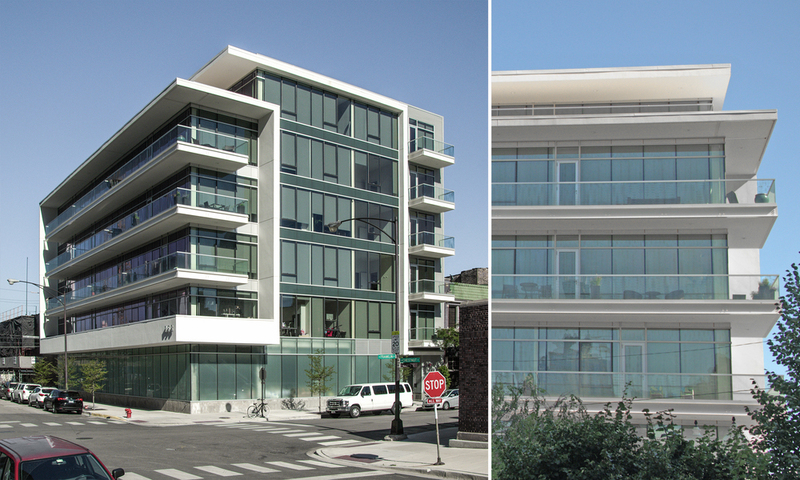 858 N. Franklin is a new, 23 unit, boutique rental apartment building in the River North neighborhood of Chicago. To the east are low structures, and immediately south across Chestnut Street is a pocket park, which affords 858 a leafy foreground to sweeping skyline views. The developer asked for a facade of mostly glass to capitalize on these views, but also requested that the massing provide more interest than an austere glass box. The solution was to use cantilevered balconies to enliven and play off of the window glazing, while providing significant shading for the south and east facades. Crisp white ribbons of stucco unfurl from the winging roofs to organize the masses and moderate the scale. Corrugated silver metal siding provides a textural counterpoint, especially at the west facade along the alley, and the north facade which sits on the property line. The ground floor parking is sheathed in continuous translucent glass along both street frontages, and glows engagingly at night.